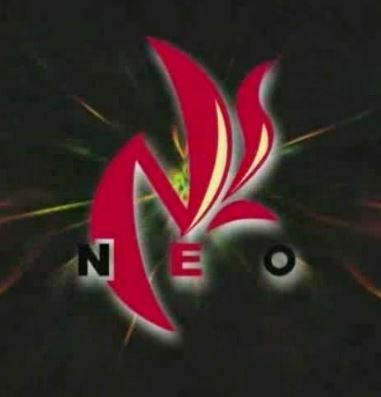 NEO Ladies was a Joshi promotion that had many re-starts but was running in some form from 1998 to 2010. Originally it was a break-off promotion from All Japan Women, and the name was supposed to be Nippon Women’s Wrestling but they had a trademark issue with New Japan Pro Wrestling. So they went with NEO Ladies instead. Kyoko Inoue was the Ace of the promotion, but over the years other wrestlers made their name in NEO including Natsuki Taiyo, Nanae Takahashi, Hiroyo Matsumoto, Ayako Hamada, and many others. I am skipping one match since it is a battle royal against West Gate Pro Wrestling, a promotion I am not overly familiar with and it was more of a comedy match anyway. Since the event was squeezed down to two hours, some matches will be clipped. This is Natsumi Kawano’s Debut Match. Don’t feel too bad if you are not familiar with these wrestlers as they are a bit obscure. Yuki actually still wrestles today, although not frequently and she mostly stays in smaller promotions, if you are a Stardom fan than you will know her better as Hatsuhinode Kamen. Kawano had a very short career, this was her debut but she later retired from NEO, she re-appeared in REINA but retired from REINA due to an injury in 2012. As far as I know she hasn’t been seen since. Yuuki pushes Kawano to the ropes to start, Kawano fires back with an elbow but Yuuki throws her around by her hair. Kawano sneaks in a schoolboy but it doesn’t work, dropkicks by Kawano and she covers Yuuki for two. Scoop slam by Yuuki, she picks up Kawano and boots her in the chest before posing to the crowd. Shoulderblock by Yuuki and she hits a second one, a third shoulderblock by Yuuki and she covers the rookie for a two count. Running elbow drop by Yuuki, but again Kawano kicks out of the cover. Yuuki chokes Kawano and throws her to the mat, rolling fireman’s carry slam by Yuuki and she gets the three count! Aya Yuuki wins! Even though it was short it was actually more even at the beginning than I was expecting. Either Yuuki is ranked even lower than I thought or they had some hopes for Kawano, as the veteran took it pretty easy on her. Kawano didn’t show anything here to make you think she’d be a star, her dropkicks wouldn’t have passed the Meiko Satomura Test, but it was only her first match after all. Nothing much to it. I feel I should explain, Athtress was a term made up by Joshi promotion Jd’ Star, which as it appears was a combination of “athlete” and “actress.” Basically it was wrestlers that were also attractive, with the idea that they would able to also have careers as actresses or models. Jd’ Star was gone before this match started, but the name stuck around for a bit and Fuka was arguable the most successful Athtress from the Jd’ Star days. Hikaru Shida and Fujimoto ironically were actresses at the time, as the “Muscle Venus” stable name came from the television series sharing the same name. Kawasaki and Shida start off the match but both are promptly jumped from behind, Shida and Fujimoto isolate Fuka but Kawasaki returns to help her partner out. Fuka and Kawasaki both hit knees to the chest but things settle back down, judo throw by Shida to Kawasaki and she hits a second one. Kawasaki kicks Shida in the back but Shida ducks the PK, another judo throw by Shida and she tags in Fujimoto. Fujimoto hits a rebound crossbody on Kawasaki but Kawasaki levels her with a boot to the face. Northern Lights Suplex by Kawasaki, but it gets a two count. Fujimoto sends Kawasaki into the ropes but Fuka kicks her from the apron, giving Kawasaki time to recover. Kawasaki tags in Fuka, kicks by Fuka to Fujimoto but Fujimoto hits a tilt-a-whirl headscissors. Sunset flip by Fujimoto but Fuka reverses it and they go back and forth with quick pins. Tiger Feint Kick by Fujimoto, she covers Fujimoto but Fujimoto bridges out of the pin. We clip ahead to Shida being in the ring with Fuka, lariat by Shida and Fujimoto hits Fuka with a Tiger Feint Kick. Shida picks up Fuka but Fuka kicks her, Kawasaki comes in but Kawasaki kicks Fuka in the head by accident. Shida picks up Fuka and hits a delayed vertical suplex, but Fuka kicks out of the cover. Kawasaki walks over and hits Shida with a heel drop, Fuka picks up Shida and she delivers the Fisherman Suplex Hold, but Fujimoto breaks up the cover. Fuka picks up Shida and hits the F Crash for the three count! Fuka and Kawasaki are the winners. I am not sure if this is a sacrilegious thing to say but I have never been really impressed with Fuka in-ring. Very attractive, apparently a solid trainer, but her strikes never had a lot of impact and the F Crash is not a good finisher since it looks weaker than what we expect from wrestlers in Japan. Its a WWE-looking finisher if you will. I am not too familar with Kawasaki but she looked good here, solid kicks, and Shida is always a treat. A short match made shorter by clipping, a few fun moments but that is about it. The battle of the Matsumotos! This was just done for fun of course. Dump Matsumoto was still fairly active in 2009, wrestling as a Freelancer in a variety of promotions. 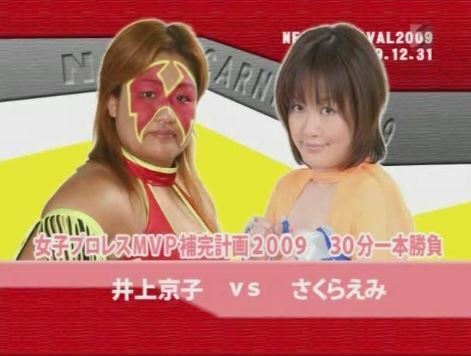 Miyako Matsumoto was (and still is) a mostly comedic Ice Ribbon wrestler while Hiroyo Matsumoto is also a Freelancer that today wrestles primarily in OZ Academy and Stardom. Dump goes right after Miyako and levels her with a lariat, body press by Dump and she kicks Miyako out of the ring. She turns to Hiroyo, Hiroyo tries to knock over Dump but Dump absorbs her blows. Hiroyo tries to pick up Dump but can’t, Miyako returns and tries to help Dump but Dump shoulderblocks Miyako back to the mat. Dump flings Miyako by her hair and Hiroyo dropkicks Miyako, Miyako keeps sliding to the apron to escape but Dump pulls her back in so that Hiroyo can hit another dropkick. Hiroyo dropkicks Dump but it has no impact, release German by Dump to Hiroyo but Miyako has returned and tries to elbow Dump. Meanwhile Hiroyo goes up top and hits a missile dropkick on Dump, finally knocking her to the mat. Miyako dances around while Hiroyo holds down Dump, Dump eventually gets up and gets her kendo stick, hitting both Hiroyo and Miyako. Miyako rolls out of the ring but Dump goes out after her and throws her into the stands. Miyako runs away from Dump and returns to the ring, she celebrates but Hiroyo grabs Miyako from behind and hits the backbreaker into a gutbuster for the three count! Hiroyo Matsumoto wins and is the best Matsumoto. As I mentioned this was more goofy filler than anything else, Dump Matsumoto does a lot of ‘comedy matches while still killing people with weapons’, it is almost one of her things these days. I always enjoy seeing Dump and Hiroyo is great, but just a short match with limited valuable aside from a few possible laughs. If you asked the average fan online which wrestler was best known for Intergender matches in Japan, they’d likely say Omega. 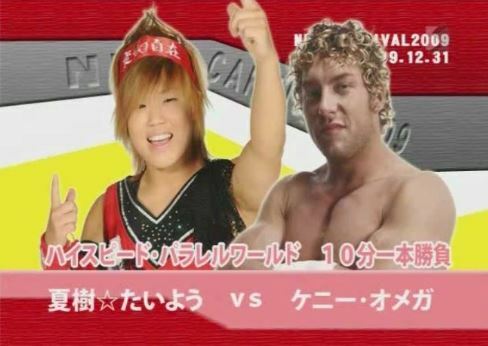 Not because he has the most, but he has the most famous when he had a match against 9 year old Haruka in Stardom. But it is a match style that Omega is clearly comfortable with as he has faced off against many Joshi wrestlers over the years. Here he is against Taiyo, who looks like a child but was 25 at the time the match took place. Taiyo was a regular in NEO, she later went on to star in Stardom before retiring in 2014. Currently she is affiliated with SEAdLINNNG, acting as their director and occasionally a referee. Omega tosses Taiyo to the mat after the bell rings and poses, Omega applies a wristlock but Taiyo reverses it before Omega throws her to the mat again. Armdrag by Taiyo and she hits another one, Omega applies a front necklock but Taiyo gets onto the ropes to force a break. The referee tries to step in but Taiyo pushes him away, armdrag by Taiyo and she hits a dropkick. Taiyo kicks Omega into the corner, Irish whip but Omega flips away from her. Omega goes for a hurricanrana but Taiyo reverses it into a powerbomb for a two count. Kicks and slaps by Taiyo but Omega comes back with a jumping kick of his own, Aoi Shoudou by Omega but Taiyo kicks out of the cover. Headbutts and another jumping kick by Omega, he goes to the apron and hits a swandive dropkick to Taiyo’s back. Snap dragon suplex hold by Omega, but Taiyo gets a shoulder up. Omega picks up Taiyo, slaps by Taiyo but Omega hits a release snap dragon suplex. The referee starts a ten count, Taiyo tries to get up but he can’t, and she gets counted down. Kenny Omega wins by KO. This was too clipped down to recommend, since the match went almost ten minutes I assume that Taiyo got in a bit more offense than this. As it was, the point was for Taiyo to show how tough she is and she did, kicking out of several of Omega’s moves and almost making the ten count at the end. Omega has never minded selling for much smaller wrestlers since he is one of the few that understands it helps everyone to make your opponent look good, and everything they showed was crisp. In full this may have been a match worth hunting down, but not so much in this abridged form. I’m excited for this match, just knowing how all of the wrestlers on the “young” team turned out to be such quality wrestlers down the road. The Shimoda team are the bad guys in this match, as Shimoda generally was, although none were officially affiliated with NEO. 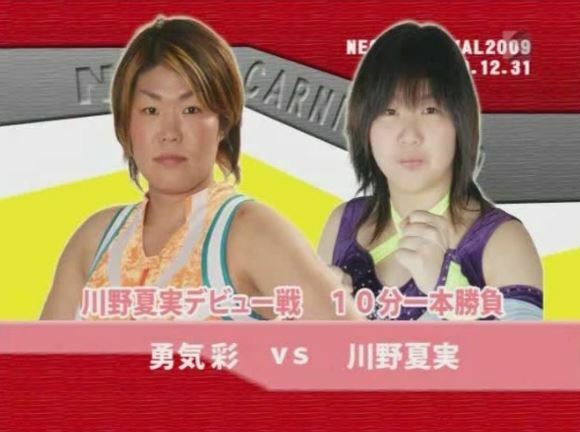 The other team was not just some of the best young wrestlers in 2009 but they turned into the future stars of Joshi, with Makoto and Io Shirai the current Aces of their promotions (REINA and Stardom, respectively). Mio Shirai was one of the top Freelancers in Joshi before retiring last year, and Ishino is better known as Kagetsu, a current champion in Stardom. At the time of the match though none had reached near that level of success and were looking for an upset against the veterans. Shimoda and company attack before the match starts and there are still streamers everywhere, Shimoda stays in with Io and she kicks her in the chest. Shimoda chokes Io in the ropes and throws her down by the hair, her teammates come in the ring and they all post on Io. We clip ahead to Io hitting a missile dropkick on Shimoda, giving her time to tag in Makoto. Armdrag by Makoto and she kicks Shimoda in the chest, jumping kick by Makoto and she covers Shimoda for two. Makoto goes for a double underhook but Shimoda gets out of it, roll-up by Makoto but it gets two. Shimoda’s teammates keep trying to help but it backfires each time, Io sails in with a missile dropkick on Shimoda and Nakagawa and they all stomp on Shimoda. The young underdogs take turns attacking Shimoda in the corner, handstand kneedrop by Makoto and she hits a second one for a two count. Makoto picks up Shimoda and nails the cross arm fisherman suplex hold, but Shimoda barely gets a shoulder up. Makoto’s friends return but they all miss dropkicks, then Shimoda kicks each one of them in the head. German suplex by Shimoda to Makoto and she hits a heel drop for a two count. Shimoda picks up Makoto and hits a tiger suplex hold, but Io breaks up the cover. Shimoda’s friends clear the ring while she puts Makoto on the top turnbuckle, avalanche suplex by Shimoda and she gets the three count! Shimoda and friends win the match. As is a recurring theme on this show, it was just too clipped to get a real feel of the action. The only legal wrestlers we saw the entire match were Shimoda, Io, and Makoto, which is disappointing when there were five other wrestlers around (I am assuming in a 15 minute match that there were more tags than that). It was fun to watch, a few things were silly like everyone waiting for Shimoda’s heel drops and not everything was smooth, but I always enjoy seeing Joshi babies. Not great since Shimoda was the focus but not bad either. In 2009, Emi Sakura was voted as the Joshi MVP by both Tokyo Sports and Nikkan Sports. I couldn’t find the complete results, so I can’t say for sure if Inoue also placed in the polls or she just challenged Sakura to show she was the real MVP. Emi Sakura at the time was the leader of Ice Ribbon, both as a wrestler and as the owner/head trainer, while Inoue was one of the founders of NEO. Sakura dropkicks Inoue right as the bell rings which sends Inoue to the floor, Sakura gets on the top turnbuckle and sails out onto her with a plancha suicida before sliding back into the ring and hitting a tope suicida. Sakura gets on the top turnbuckle and hits a moonsault down to the floor, making three dives by Sakura in the first 20 seconds of the match. Sakura puts Inoue on a table at ringside and goes up to the top turnbuckle, she hits the Nyan Nyan Press but the table doesn’t break, probably making it even more painful for both. Sakura doesn’t care and gets back in the ring, Inoue joins her and Sakura hits a somersault senton for a two count. Sakura goes up top again but Inoue has had enough and clubs her in the head, Inoue joins Sakura but Sakura hits a sunset flip powerbomb for a two count. Sakura goes up top again but again Inoue joins her, and this time Inoue delivers a superplex. Lariat by Inoue, she picks up Sakura but Sakura chops her in the chest. Inoue absorbs the blows and floors Sakura with a hard elbow, Sakura gets back up but Inoue hits a lariat. Big powerbomb by Inoue, but Sakura kicks out of the cover. Inoue picks up Sakura but Sakura slides away and applies La Magistral for a two count. Lariat by Inoue, she waits for Sakura to get up but Sakura ducks the lariat attempt and hits a low flying crossbody for the three count! Emi Sakura wins! Takahashi and Kana, part of a stable called Passion Red, won the tag team titles from Hiroyo Matsumoto and Kyoko Inoue on October 10th, 2009 when Takahashi pinned Inoue. This match is their second defense of the title, after defeating their friends Taiyo and Passion Ray on November 22nd, 2009 in NEO for their first defense. Tamura was one of the lead wrestlers in NEO and had already won the title twice before, but up to this point the young Kurihara had never won a championship in her career. This match has to deliver, since the other matches on the show were too clipped and nothing has really stood out up to this point. Kana and Kurihara begin the match and immediately trade strikes, Kana jumps on the second turnbuckle but Kurihara dropkicks her out of the ring. Kurihara goes up top and dives out of the ring onto both Kana and Takahashi, she slides Kana back in where Tamura is waiting and they both attack Kana in the corner. Double cutter to Kana but Kana avoids the double vertical suplex only to eat a STO. Takahashi has also come in the ring, they are tied together on the mat and both are dropkicked in the head. Tamura stays in with Kana and hits a bridging vertical suplex, picking up a two count. Kana fights back with elbows and kicks but Tamura blocks one and hits a DDT. Suplex by Tamura, she picks up Kana but Kana slaps her in the face and kicks her in the chest. Kick to the head by Kana, and she covers Tamura for two. Kana tags in Takahashi, lariat by Takahashi in the corner but Tamura avoids the next one and delivers a high kick. Kurihara runs in and dropkicks Takahashi, Takahashi lariats out of the ring while Kana knocks Tamura out as well. Kana hits a hip attack off the apron onto Tamura, Takahashi gets a running start in the ring and sails out onto both of her opponents with a tope suicida. Kana waits while Tamura is slid back in and hits a diving hip attack onto Tamura off the top. Takahashi then goes up top and hits the Refrigerator Bomb, but Tamura gets a shoulder up. Takahashi goes for a backdrop suplex but Tamura lands on top of her and then hits a backdrop suplex of her own. Takahashi quickly comes back with a backdrop suplex but Tamura then hits another one. A final backdrop suplex by Takahashi ends the series as both are slow to get up, both wrestlers elbow each other until Takahashi hits a lariat for a two count. Tamura blocks the next lariat attempt and rolls Takahashi to the mat, fancy inside cradle by Tamura but it gets a two count. Tamura picks up Takahashi but Takahashi drives her back into the corner, neckbreaker by Tamura and she goes up top, but Takahashi joins her. Avalanche side slam by Tamura, Kurihara goes up top and Tamura helps her hit a somersault senton. Cobra Clutch Suplex by Tamura and she covers Takahashi, but Kana breaks it up. The main issue with this show is simply that it is very hard to squeeze eight matches on a two hour recording. By the time you add in the pre and post match video packages and entrances, there simply isn’t enough time for the wrestling itself. That led to really only the final two matches being shown in full or close to full, with the rest just being extended highlights. On the plus side, all of the early matches ranged from average to really fun, and nothing was bad on the show. The real hero of course was the main event, just a fantastic match with four great wrestlers, and they had plenty of time to put on a memorable match. The tag title match is the only must-see match on the show, but top to bottom its a pretty easy watch even though a lot of the action was missing.